Tagged "Carnival Games: In Action"
I didn’t get my first taste of Kinect until a couple of months ago. A friend asked me to sell his on eBay along with Kinect Adventures and Kinect Sports. What type of friend would I be if I didn’t give it a good test to see if it’s fully working beforehand? Not a very good one is the answer. I at least had to check that the achievements unlocked. And so I spent an entertaining afternoon messing around with Adventures – which is a clear cut above most mini-game collections – and sampling the sports in Kinect Sports. Apart from the football – sorry, soccer – game which doesn’t flow too well, it’s a really nice package. Even the volleyball game is pretty good. It wasn’t until the arrival of Child of Eden that I decided to purchase my own Kinect. The price of Kinect games has taken a tumble over the past few months – I was able to get the device with Kinect Adventures and Carnival Games: In Action for £100, and then picked up Kinectimals for £12.99 and Get Fit with Mel B for four measly quid. 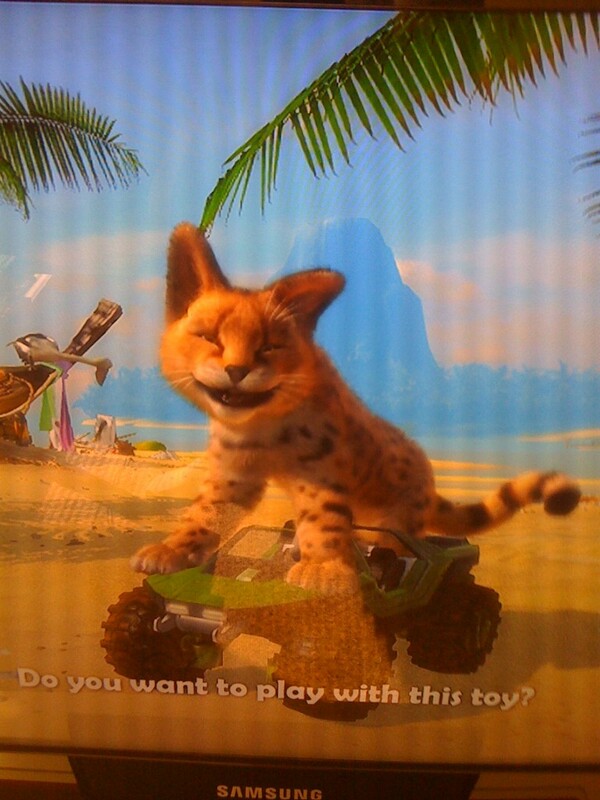 Kinectimals really struck a chord with me. Considering it was a Kinect launch title it’s incredibly polished with visuals that aren’t far off from CGI. Whereas most virtual pet games become dull as soon as you’ve catered to your pet’s needs, here there is always something new to do or see to keep your interest levels up. 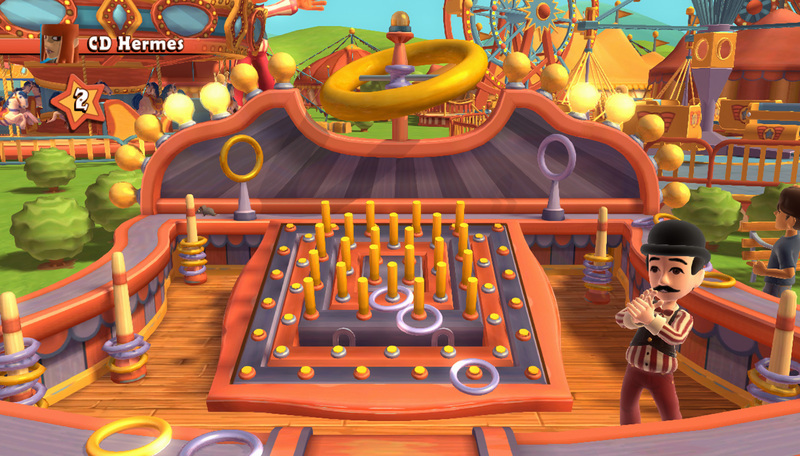 Selecting a toy out of the toy box makes a random challenge instantly appear on screen – bring a ball out and a coconut shy or target range will spawn out of nowhere. There’s no penalty for failing these challenges but beating them awards adventure points that are used to unlock new areas of the map, and ergo progresses the story which involves pirates and treasure. You can also pester your pet with RC cars, some of which are based on vehicles from Halo. It really is a lovely and charming game full of nice touches. From petting to prancing. I won’t spend too much time talking about Get Fit with Mel B because I assume it was cut to £4 due to a lack of popularity. It isn’t bad though – you appear on the screen in a fuzzy digitised form, standing next to Mel herself. The idea is to copy what she does and then you’re shown how well you did in the form of a percentage. There are warm up and cool down exercises and you can choose what your goals are – like losing fat off your gut, or generally having more stamina. It certainly works – I sweated in places I didn’t even know produced sweat. Then we have Carnival Games: In Action. Or Carn-evil Games as it should be known. I don’t think I’ve ever detested a game so much. Two hours was all it took to play each mini-game three or four times and unlock a majority of the achievements. After those two hours I wouldn’t have returned to this game even if you paid me. Just about every mini-game irritates and most boil down to pure luck – I played hoopla about 20 times and only twice did the hoop go over the pole. Then there’s a roller coaster mini-game where you have to put your hands out to collect stars and avoid bad things but because the coaster is full of dips and turns you can’t see what’s coming. It took me five attempts to get a score that wasn’t in minus figures. Barker the ringmaster – the chap in the bowler hat – taunts you with wisecracks throughout, making this even more of a thoroughly teeth gratingly bad experience. Fair play to the developers for not lazily converting the Wii version, I suppose, but the only good thing about it I found was that I was able to trade it in for something else.